Narthangai ilai podi is very healthy and enhances the digestion process. 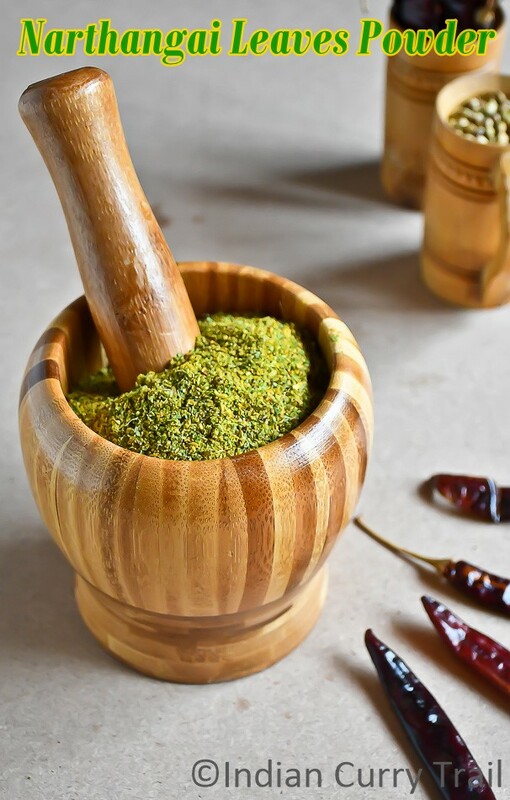 Consuming this podi regularly will improve the immunity power and removes the impurity from the blood. This powder stays good in room temperature for a month and tender citron leaves have to be used. The leaves are cleaned, vein removed and shadow dried for two days before making this powder. This healthy powder can be perfect side dish for idly and rice.This is different from veppilaikatti. The recipe video is given below. Please subscribe and share if you like. 1. Choose the tender narthangai leaves and remove veins. Shadow dry them without changing the colour. If you find any yellow or brown dried leaves, hand pick and remove them. 2. Add 2 teapoons of gingelly oil in a heavy pan and dried citron leaves. You may need to roast them part by part as the quantity is huge. 3. Transfer the roasted leaves to a plate. 4. To the same pan, add the fresh grated coconut and roast till it becomes nice brown.This step is important and there shouldn't be any moisture. Once roasted, transfer it to a plate and cool down. 5. To the same pan, add a tsp gingelly oil, add urad dal, coriander seeds and dry red chilies and garlic one by one and roast every thing and cool down. 6. 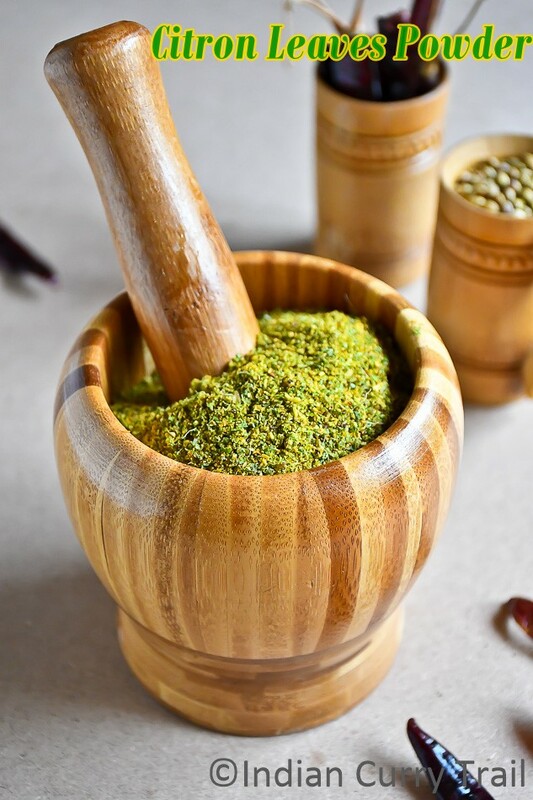 Once all the ingredients are cooled down to room temperature, grind it to a coarse powder. 7. Towards the end, add salt and pulse once. 8. Cool down this powder and store it in a clean dry container. It is a condiment, usually eaten with rice. Add a tablespoon of citron powder to a cup of hot cooked rice along with 1 or 2 teaspoons of gingelly oil. Mix well and enjoy. It can also be eaten with idly and dosa as a condiment. 1. Make sure to dry the leaves well and roast the coconut well. If these two steps are done correctly, this powder stays good for a month or two in room temperature itself. 2. 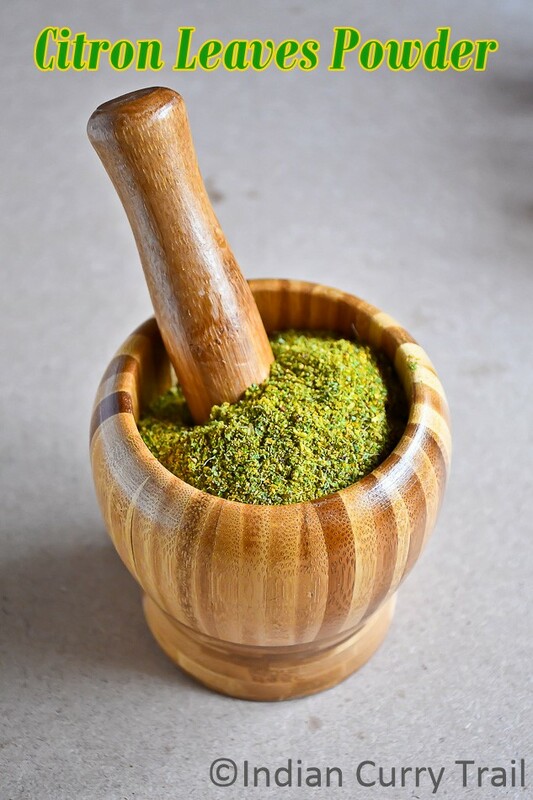 While grinding this powder, if you find any difficulty, make a powder of leaves first and then add the rest of the ingredients and powder it. 3. Add salt only after powdering the leaves to get the correct taste.